Thai Baht is the official currency of the Kingdom of Thailand. The currency is represented by the symbol ฿ and by the ISO code THB. The currency is subdivided into 100 Satang. The banknotes and coins are issued and circulated by the Bank of Thailand. The banknotes of 20, 50, 100, 500, 1000 ฿ and coins of 25, 50 Satang, 1, 2, 5, 10 ฿ are issued by the Bank of Thailand. The Thai Baht has an exchange value of 2-3 Indian Rupees. Check the live rates of Thai Baht against the Indian Rupee here. Thailand is a unitary parliamentary constitutional monarchy under a military dictatorship in SouthEast Asia. The country was one among the neighbouring nations that shares and Indian ancestry and origin. Thailand is one of the most famous tourist hotspots in SouthEast Asia. Thailand is a country with extensive natural resources and agriculture as the chief labour practice. The nation is one of the world’s largest exporters of rice. A significant amount of revenue from the tourism industry is experienced by Thailand. The relatively cheap expenses on amenities and bang for the buck experience made Thailand a favourite among western travellers. It is also a place where Indians visit most too. The Thai economy is based on the export industry. Thailand hosts manufacturing units of many of the world’s vehicle manufacturers. Due to the labour and resource availability, they concentrate on Thailand. Exports determine the value of the Thai Baht and the economic condition. Agricultural produces, electronic components are among the other things that constitute the export Industry of Thailand. Thailand is a popular destination for Indian tourists made the Thai Baht one of the most traded currency in India. Hence the availability of the currency is not a problem. Thailand is a popular destination among Indians. Hence the Thai Baht is available at any major banks and exchange houses. The Indian Rupee can be easily converted to Thai currency with the help of ExTravelMoney.com. Find the vendor in your region with the best exchange rate from our website and place the order with us. Confirm the order with our support team and make the payment online. You can even request the vendor to deliver the forex to your location and pick up the KYC documents. If you have Thai Baht as leftover currency in your wallet or forex card from your recent trip to Thailand and is looking for a place to change it to Indian Rupee, ExTravelMoney.com is the right place for you. 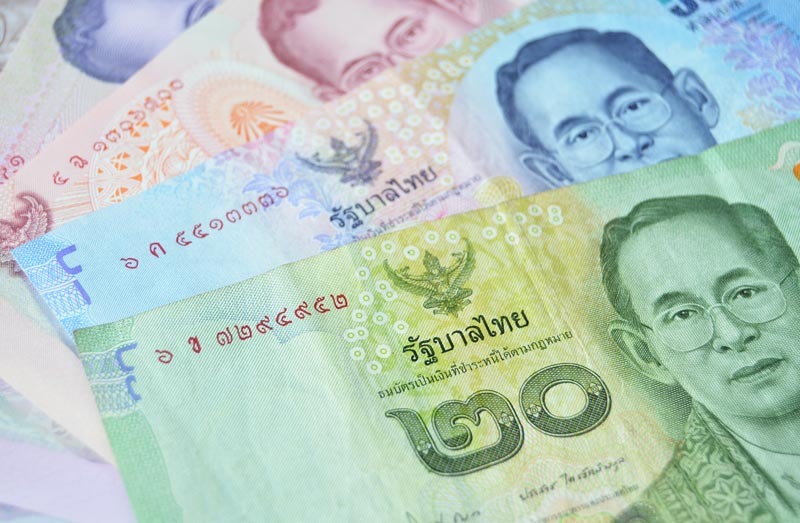 Or if you are somebody from Thailand visiting India we can help you convert Thai Baht to INR. Choose from the list of vendors along with the exchange rate that they offer from our website and place the order for the right one. Shortly our customer care executive will contact you for confirming the order. There is even the option to request the vendor to collect the forex and KYC documents from your location.